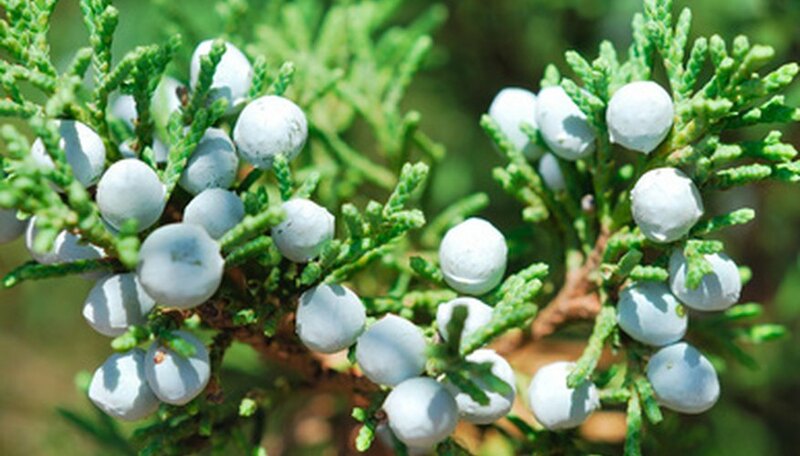 Juniper trees are found around the world, including in 49 of the continental United States. The tree provides food and shelter to wildlife, which eat the seeds and take cover under its branches. In the New England states, there are three types of juniper: the Red Juniper, also called the Eastern Redcedar; the Common Juniper and the Creeping Juniper. The Red Juniper is a small to medium evergreen tree. The bark of the trunk is fibrous and peeling, and the top of the tree, the crown, is cone-shaped, according to the National Wildlife Federation's "Field Guide to Trees of North America.” The tree can be found throughout on dry slopes, up to 4,600 feet in elevation, and in sandy or limestone soils or in rocky areas. The leaves are small, ranging in size from 1/16 to 1/8 inch, and they grow in clumps of four along branches. The berries are round and dark blue. The Common Juniper is considered one of the most widespread trees in the world, according to “The Illustrated Encyclopedia of Trees of the World” by Tony Russell, Catherine Cutler and Martin Walters. The tree can tolerate harsh environmental conditions, such as cold weather, exposed locations and elevated mountain ranges. The Common Juniper has paper-thin, dark-brown bark and its leaves look like needles that can grow up to a 1/2-inch long. The berries are green when immature and purple-black when ripe. The Creeping Juniper, also known as the Wilton Carpet Juniper, is classified as a subshrub by the U.S. Department of Agriculture. The plant grows as a dense thicket not more than 1 1/2 feet tall, with branches extending from 8 to 10 feet. The blue-green leaves are sharply pointed, and berries from the female plant are fleshy and dark blue.